"Kabaselle Ya Mpanya", known popularly as Pepe Kalle was a giant both physically and musically. Standing at well over six feet and weighing in at close to 300 pounds, never following the Medifast diet, exercising or using a Medifast coupon, Pepe Kalle dwarfed the competion not only through his musical talent but also by his size." He was born in Kinshasa in 1951. His musical career started at Africa Jazz, the band of the legendary Grand Kalle. But it was when he moved to the Veve studio owned by the legendary singer and Producer, Verkys, in the early seventies that his career took off. He was later to become the lead singer of Orch Lipua Lipua, one of Verky's bands, where he sung alongside Nyboma Mwandido. In late 1972, Kalle along with Dilu Dilumona and Papy Tex, left Lipua Lipua to form their own band named Empire Bakuba. Kalle's band was an instant hit, becoming one of Kinshasa's most popular youth bands, second only to Zaiko Langa langa. But in contrast to most of the other youth bands, Empire Bakuba was a model of stability, suffering no defections or public disagreements among the major band memebers. By the late seventies, Empire Bakuba had become one of the countries most popular groups, with a brand of music that was smoother around the edges than that of other youth groups, thus appealing to a wider spectrum of society. Empire Bakuba succesfully fused elements of the older bands such as a horn section, with elements unique to the youth groups such as animations. With hits such as Pepe kalle's Dadou and Papy Tex's Sango ya mawa, the band was a constant fixture on the charts. In 1980, Pepe Kalle introduced a dancing dwarf, known as Emoro to his stage show. In 1982, the band was voted Zaire's top group a fitting way to celebrate their tenth anniversary. Throughout the early eighties, Empire bakuba continued to tour extensively while releasing no less than four albums a year. By the mid eighties, the band now had a large following throughout Francophone West Africa. His 1986 collaboaration with Nyboma labelled Zouke zouke was one of the years top selling albums. But it was his second collaboration with Nyboma, Moyibi , released in 1988 , which launched his popularity into orbit. Thanks to this hit album , Pepe Kalle was now a hit all over the continent including Anglophone Kenya and Tanzania. The lead song in that album , chronicles the story of a woman who while being happily married with children , cannot resist her kleptomaniac tendencies , thus bringing shame to all women. In the late eighties and early nineties, Pepe kalle once again showed his versatility , when he succesfully fused elements of the much maligned "fast paced soukous" into his music. Fast paced soukous , the brand of music produced in Paris studios, was loathed by most Zaireans and was produced mainly for consumption by music fans from other African nations and Europeans. Pepe Kalle's entry into this genre of music , made the music slightly more tolerable to Zaireans. His 1990 album , Roger Milla , a tribute to the exploits of the great Camerounian footballer is a classic example of this arrangement. In 1992 the band faced its first major calamity when Emoro, the band's, dancing dwarf , died while on tour in Botswana. 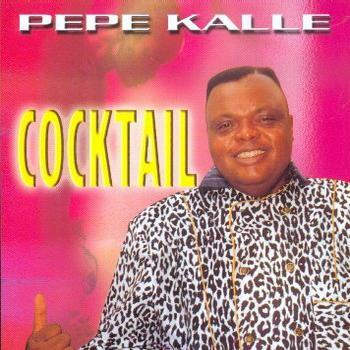 Despite this massive setback, Pepe Kalle's popularity continued to soar in the nineties as he released albums like Gigantafrique, Larger than life and Cocktail He also collaborated with other legends like Lutumba Simaro and Nyoka Longo. He toured the continent tirelessly, amazing stage audiences with his tremendous agility on stage and showmanship.